‘Vincent’ a is short film, which director Tim Burton made while still working at Disney. The short is as typical for Tim Burton as it is atypical for Disney. First, it’s a stop-motion film, something the studio was not famous for, at all. The only other stop-motion film ever released by the studio was ‘Noah’s Ark’ from 1959. Second, the film is in black and white, and third, it has a genuine horror theme, miles away from the child friendly worlds of contemporary Disney films, like ‘The Fox and the Hound‘ (1981) or ‘Mickey’s Christmas Carol‘ (1983). 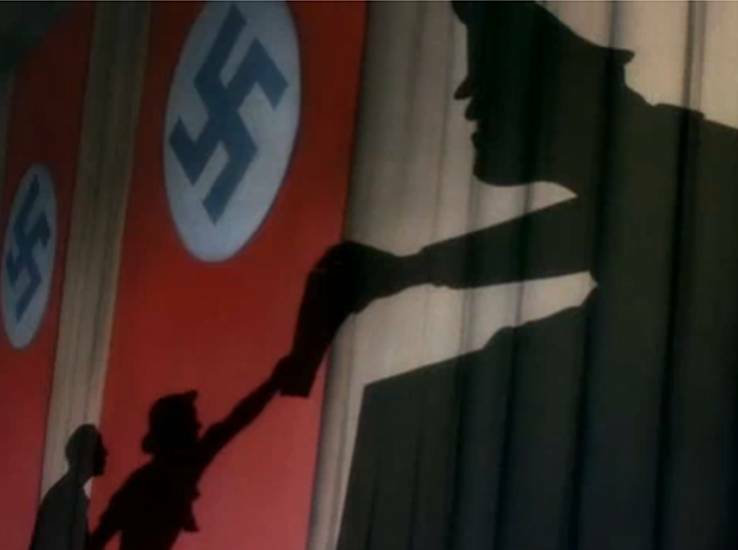 The film uses the deep voice of classic horror star Vincent Price to tell the story of Vincent in rather Dr. Seuss-like rhyme. Vincent is a little seven year old boy, who wants to be like, well… Vincent Price. Because his mind has become twisted by reading stories by Edgar Allen Poe, Vincent imagines himself a madman haunted by his deceased wife, and locked in by a cursed house. In the end his imagination runs haywire, taking hold of him. Burton does an excellent job mixing horror with silliness. The result is a rather twisted version of ‘Gerald McBoingBoing’ – equally weird, equally expressionistic, but much darker. In ‘Vincent’ you find much of the Tim Burton to come. It’s not hard to see the link between this wonderful short and ‘The Nightmare before Christmas’ (1993), ‘Corpse Bride‘ (2005) or with his live action films like ‘Beetlejuice’ (1988) or ‘Sleepy Hollow’ (1999). Interestingly, in the same year, Vincent Price would also lend his voice to the Michael Jackson song ‘Thriller’. In this narrated short a lion deliberately gets himself caught to scare the people in New York. Unfortunately, he’s all but unnoticed there. 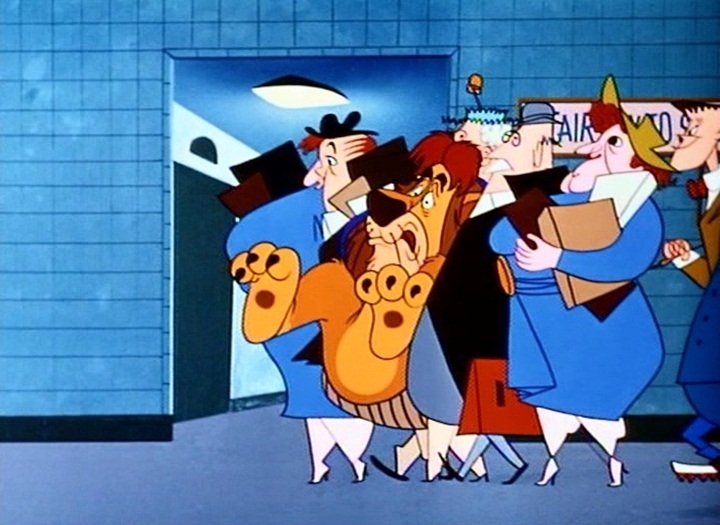 ‘Social Lion’ was the last of three ‘special cartoons’ Jack Kinney directed in 1954, after his own Goofy series had stopped. It is, unfortunately, not a very successful cartoon. Its narration is trite, its timing poor and its animation, by veteran Norm Ferguson, heterogeneous: the full animation of the lion is awkwardly out of contact with the highly stylized animation of the humans. Unfortunately, ‘Social Lion’ would be the great animator’s last statement. the Disney studio fired Ferguson in July 1953. He died four years later of a heart-attack, at the premature age of 45. The cartoon reuses the weird safari song from Kinney’s earlier, way more successful short ‘African Diary’ (1945). 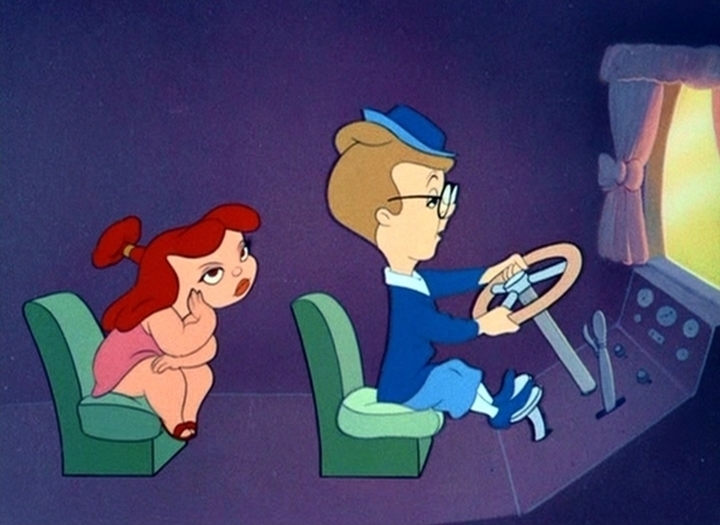 After his own Goofy series had stopped in 1953, Jack Kinney directed six other shorts at the Walt Disney Studio. ‘Pigs is Pigs’ is probably the best of the lot. It’s a story in rhyme and song about a railway station employee who does everything by the rules. At one day he has a dispute with a Scotchman about whether guinea pigs are pigs or not. The guinea pigs remain at the station until the bureaucrats of his company have found out the answer. Unfortunately, the animals multiply by the hour, soon filling the complete station. 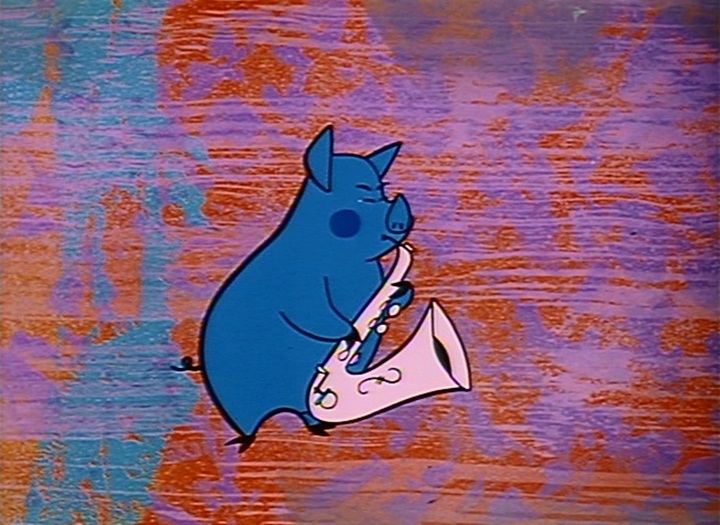 The designs and animation of this short are highly stylized, making ‘Pigs is Pigs’ a prime example of ‘cartoon modern’, despite its 1905 setting. The scenes at the railway company are the best, ruthlessly parodying the aimless ways of bureaucracy. 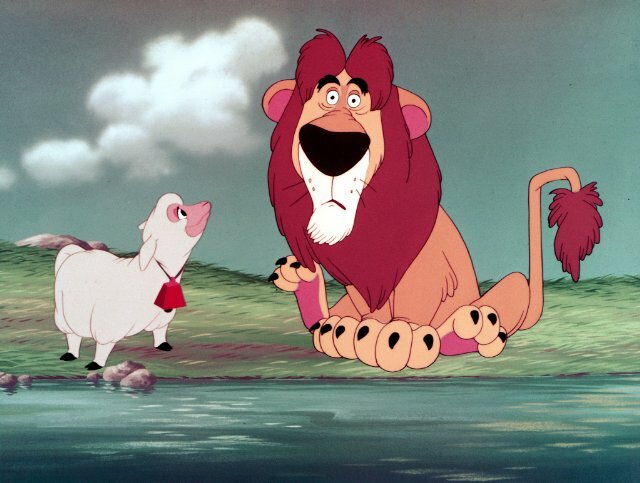 Half a year after ‘Lambert the Sheepish Lion‘, voice actor Sterling Holloway returns as a narrator for a Disney cartoon. Here he tells the story of a little house on a hill in the country side who is soon surrounded by the city and forgotten. The house’s first neighbors are arrogant and aristocratic wooden houses, which soon burn down. The second neighbors are sloppy brick houses, which are pulled down in the end. Her third neighbors are enormous skyscrapers. When the little house thinks she’s finished, she’s moved to start anew on the countryside. This sweet little story is based on a children’s book from 1942 by Virginia Lee Burton and uses a slightly different design to remain faithful to her original illustrations. Like ‘Lambert the Sheepish Lion’, the story is very sweet, not funny. Its main attraction are the humanized houses, excavators and such. However, the story is well-told, thanks to story man Bill Peet. It contains heart and has a strong sense of nostalgia. In fact, conservative nostalgia has rarely been put more convincingly to the screen. The film is strongly anti-urban and anti-progress, and full of longing to the peace and quiet of a bygone era. 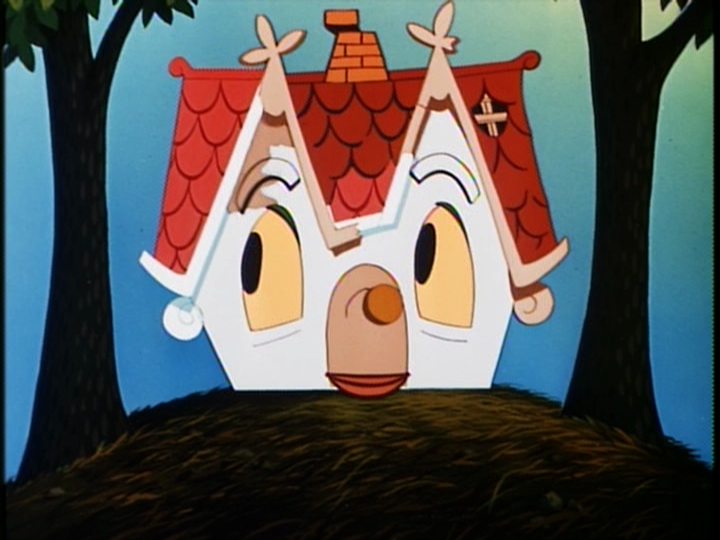 Its message is expressed at the end of the cartoon, when Holloway tells us that “the best place to find peace and happiness is in a little house on a little hill way up in the country”. ‘Morris, the Midget Moose’ starts with an eldery bootle beetle who tells two young bootle beetles the short’s story. The beetle tells us about Morris, a very small moose with normal antlers who befriends Balsam, a moose with small antlers. They’re both outcasts, but together they defeat the reigning moose, the invincible Thunderclap. This moralistic story is very sweet, but also slow and boring. It reuses a gag from ‘Moose Hunters’ (1937) of moose throwing each other on the ground, affecting the complete landscape, but the gag is executed less elaborately, and with less funny results. 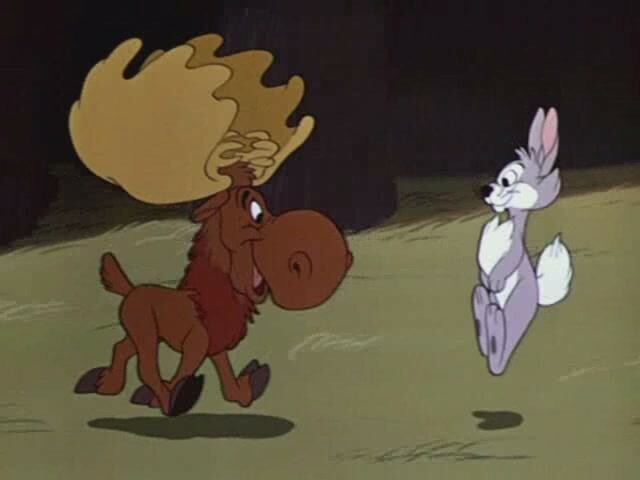 ‘Morris, the Midget Moose’ was the only cartoon featuring Bootle Beetle outside Jack Hannah’s Donald Duck series. It was also the little insect’s last appearance on the movie screen. After the Walt Disney studios quit its package features, it started to release ‘specials’ again, one-shot cartoons featuring no recurring character. These specials were essentially the successors of the Silly Symphonies, and a few were made during World War II. 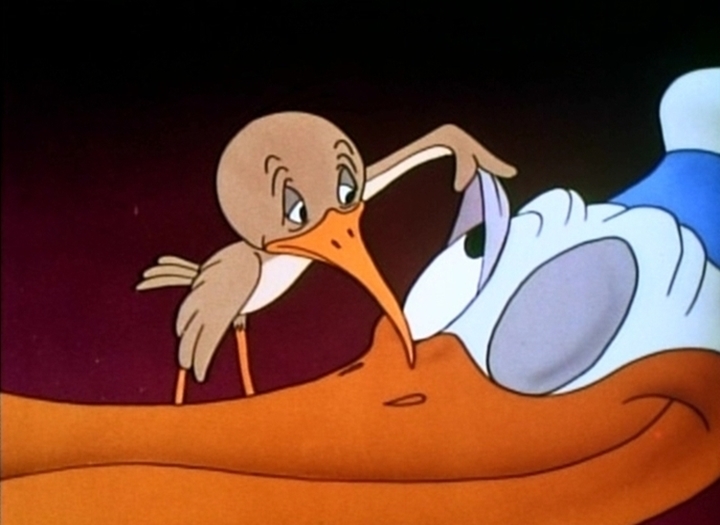 However, most of them were made in the fifties, if not necessarily to advance animation, then certainly to keep animators busy between feature films. 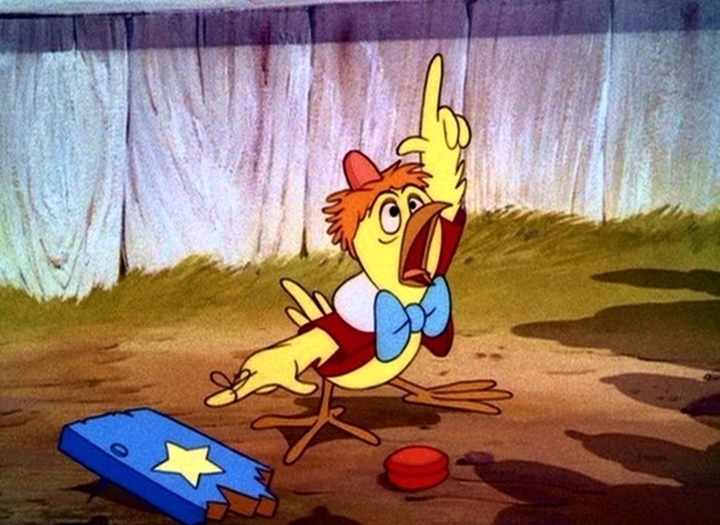 Unfortunately, almost none of these shorts match the inventiveness of the Silly Symphonies or were really successful (the Academy Award winning ‘Toot Whistle Plunk and Boom’ (1953) is the prime exception). For example, ‘The Brave engineer’, the first special from the fifties, looks like it has been a left-over from the compilation feature ‘Melody Time‘ (1948). Like this feature’s sequences ‘The Legend of Johnny Appleseed‘ and ‘Pecos Bill‘, it’s a half sung and half narrated tall-tale based on a poem about a legendary American hero from the 19th century. Despite the relatively fast pace and many corny gags, the story never really takes off. The viewer somehow never gets involved in the story and remains uninterested to the end. 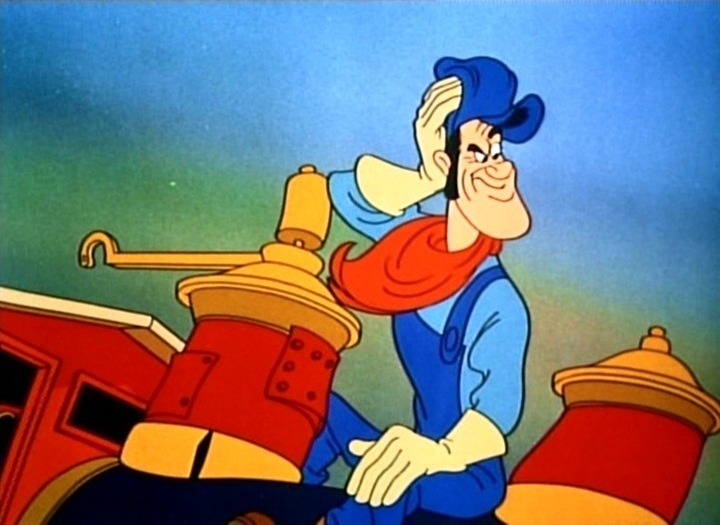 ‘The Saga of Windwagon Smith’ was Disney’s last tall tale cartoon after entries like ‘Pecos Bill‘ (from ‘Melody Time‘, 1948) and ‘Paul Bunyan‘ (1958). Unlike the former, which were rooted in American folklore, this story seems to be an original, although it retains a traditional feel. The story, which is sung in rhyme, tells about Windwagon Smith, a sailor who arrives at a small town in Kansas on a wagon with a sail. He convinces the villagers to make even a larger one to sail the prairies to Santa Fe with. But when it’s ready the villagers get scared and abandon the ‘ship’, except for Molly, the mayor’s daughter, who’s in love with Smith. Together they vanish into a storm. 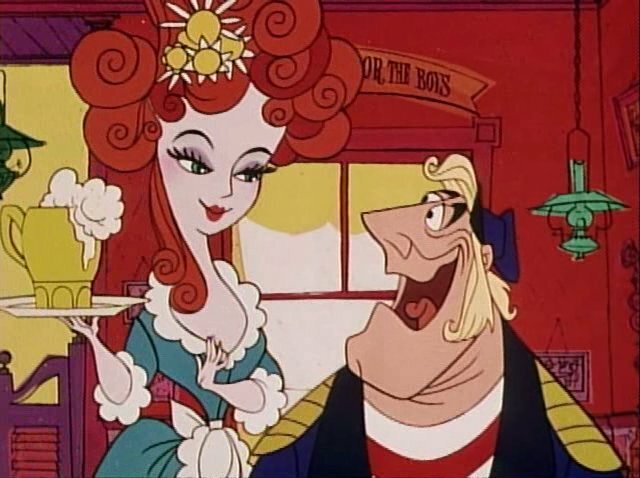 ‘The Saga of Windwagon Smith’ was the last cartoon to be directed by Charles Nichols. It’s also the last of only six shorts directed by him not to feature Pluto. It’s moderately stylized except for Molly, who’s conceived and animated in a charmingly stylized way. 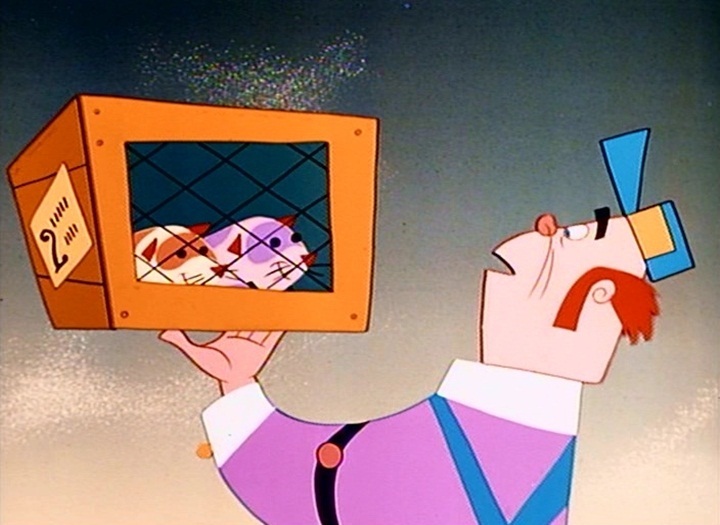 Nichols left Disney in 1962 for Hanna-Barbera, where he worked on countless television series. In the late 1980s he returned to Disney, where he worked onto his death in 1992, 81 years old.